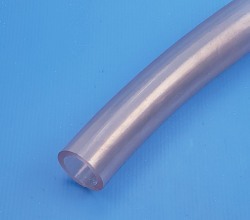 2" ID by 2-3/8" OD Clear PVC pipe size tubing by the foot. 3/16th wall thickness. Non-toxic, FDA approved for use in USDA meat and poultry plants. This hose is 2" Sch 40 pipe size and will glue into standard 2" Sch 40 fittings. It has no pressure rating because it's a hose, so we can't guarantee pressure, but it should work for low pressures. Higher pressures you would have to test your situation. This clear pipe size hose will kink if you bend it too tightly so be sure to support it where needed. For high pressure applications use with insert/barb fittings and secure with a clamp. For low pressure applications you can glue it directly into a sch 40 2" fitting using standard pvc glue and primer.